For the best in Western NY landscaping services, look no further than Vision Lawn Care & Snowplow, your number one WNY landscaping company. For years, we have been providing Western New York communities with our professional landscaping, snow plowing and other grounds maintenance services. Whether you are looking to increase your home’s visual presence or have a hard time finding time to complete your yard work, you can count on Vision Lawn Care & Snowplowing for help! Western NY endures a pretty tough winter season and often time homeowners just can’t keep up with the amount of snow that can fall in a short period of time. 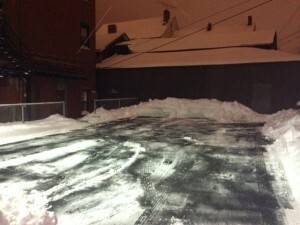 When this is the case, know that professional snow plowing and snow removal services are just a phone call away. Ensure that you don’t get snowed in this winter with snowplowing services from Vision Lawn Care & Snowplow. From landscaping to bobcat services to snow plowing and grounds maintenance, Vision Lawn Care & Snowplow offers it all. For a free estimate on our WNY lawn care and snow removal services, click on our contact page and fill out the short form and one of our representatives will get back to you in a timely manner. For a faster response, call 716-807-7008. We look forward to working with you and transforming your home’s image! Sidewalk after one swipe from our truck.